SUV drivers searching for a Jeep near Corpus Christi or Kingsville can visit Allen Samuels CDJR Aransas Pass for our extensive selection. From the versatile Jeep Cherokee to the off-road legend that is the Jeep Wrangler, our inventory of Jeep SUVs makes us the Jeep dealer for Corpus Christi. In addition, the entire model line was awarded the 2018 4×4 Manufacturer of the Year honor from 4×4 Magazine, and the Jeep Wrangler earned a spot in Kelley Blue Book’s 2018 Best Resale Value awards — put simply, now is a great time to buy a Jeep in Corpus Christi! 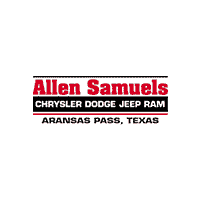 Why Shop For New Jeep SUVs at Allen Samuels CDJR Aransas Pass? To start, our range of custom and lifted Jeeps shows our commitment to the Texas off-road community, and we even carry and install Jeep performance parts to personalize your SUV for performance or simply turning heads. In addition, Jeep incentives can make a full-powered SUV more approachable than you might think. If you see a model that catches your eye, contact us to schedule a test drive, or call us at (361) 386-2626 with any questions.